The page where other people's Hofners are featured. 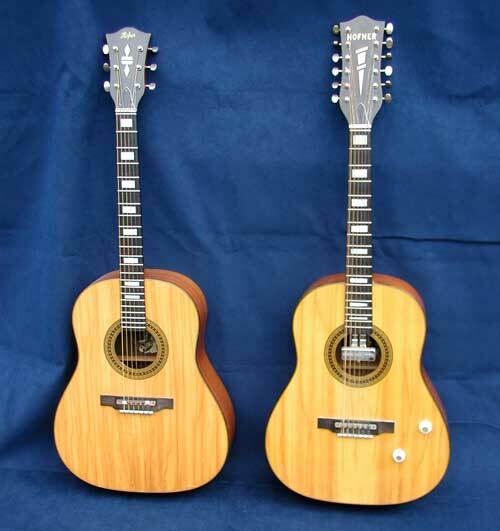 Georg Strobel's Hofner 499(ii) Acoustic Guitar and Hofner 499E Electric 12-String Guitar. The following picture-sets of Hofner flattop guitars have been sent to me over the years by their owners. This has allowed me to present a much greater range of models and vintages than encompassed by my own collection on the website, and maybe this will help other visitors to the site to identify and date their own Hofner. A small-bodied flattop guitar that was produced for less than three years from 1968 to 1970. This guitar had a 14�" lower bout body width, as opposed to the usual 16" on the other Hofner acoustics. It was also unique in having an adjustable steel bridge screwed down directly onto the body top. Owned by Michael Hickey in the USA. A flattop with laminated spruce top and a flame maple back. This particular guitar has had a De Armond pickup fitted to its soundhole. It is also finished in sunburst, which is fairly unusual for a 489. Owned by Mark in Canada. This guitar was purchased brand-new by Gerry Jones in 1975. Unusually, it has a black lacquered neck. A much later example, owned by Bernhard Zubragel of Germany. The 4890 was developed from out of the 489, with again a laminated spruce top and modestly flamed maple back and rims. The body back, rims, and neck were stained dark brown. It had a glued-in neck joint however, up-graded tuners, and a very distinctive soundhole decoration. This example is owned by Georg Strobel in Germany. An almost identical example of the 4890, recently restored by James Payze Guitars in Suffolk, England. This guitar is owned by Bob Cocozza in Florida, USA. A good quality spruce top with laminated mahogany back & sides flattop, acting as Hofner's answer to the Gibson J45. This one's a brunette, but blonde top finishes were also available for a few more marks/dollars. Owned by Soren Koch in Copenhagen, Denmark. Good quality photos of a 491 from the same period as the one above. Owned by Gene Carl Feldman, Washington DC, USA. A nice example of a mid 1960's Hofner 491, owned by Lennox Killner. This guitar has been played by three generations of the Killner family..
A left handed 491, factory fitted with a soundhole pickup and body-top-mounted controls. Owned by Charles Broschart in the USA. This example is finished in an attractive three-tone black/red/yellow sunburst. Owned by Norbert Boekhout in The Netherlands. A later example of the Hofner 491. By this stage the 491 had lost the mother of pearl "dagger" headstock inlay. Owned by Bernhard Zubragel in Germany. A development from the popular 491 model. Introduced in 1973, the 4910 had a simpler soundhole rosette and was fitted with Schaller enclosed tuners. This guitar is owned by Bob Cocozza in Florida, USA, and has been recently restored by James Payze Guitars in Suffolk, England. An unusual guitar. Good quality with solid spruce top and mahogany back/sides. Beautiful headstock inlays, a five-piece neck, and...a body cutaway. This particular guitar is steel-strung, although Hofner originally intended it to be nylon strung, hence the classical style bridge/tailpiece. A non-cutaway version was also produced. Owned by Philippe in the South of France. Another nice example of the 495/S. Harry Sinanian of Queensland, Australia has supplied some excellent detail photos of his guitar. This version of the 495 has a "pin-type" bridge for steel strings. Seems like Hofner made versions for both steel and nylon stringing. The guitar has also been signed by Pat Halcox, and Chris Slaughter, both well respected Jazz players back in the 1950's. Owned by Hans Stamer (R&B Allstars; Hans Stamer Band; Stamer & Schuld; Long John Baldry; etc). This 495 is the version without the body cutaway. Because the headstock has the bold Hofner logo but no-truss rod, I would guess that it was made between about 1957 and 1959. Owned by Johann Frisch in Bavaria, Germany. Back to no "Hofner" logo on the headstock again. A lovely cutaway-body example owned by Guy Audoux in France. 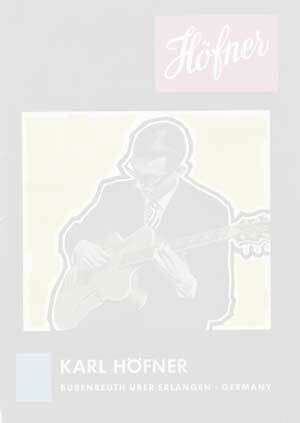 It would seem that during the 1960's, Hofner were using the Stauffer-Legnani method of bolting the neck to the body horizontally through an un-glued joint in order to provide a degree of neck rake adjustment. This technique is illustrated in the photos of this particular example. Many thanks to Hans Peter Müller of Germany for showing us this feature on his guitar. Also, note that in the 60's, the 495 has an adjustable neck truss rod and all fret markers are the three dot type. Another fine example of the 495/S similar to the one above, owned by Dan Nicholson in London, UK. A non-cutaway Model 496 this time, owned by Mike Kennedy in Pennsylvania, USA. A lovely example of Hofner's prestige flattop, owned by Jean-Marie Lavall of Paris, France. Another example of Hofner's premier flattop from the 1960's and 70's. Owned by Greg Feo in California, USA. I'm fairly sure that this is a 496, despite the fact that the fret markers and headstock inlays are not quite the same as every other 496 I have seen. It does have the beautiful spruce/flame maple inlayed body, the mother of pearl, and the gold plating though. Owned by Tom Dees of Tennessee, USA. I believe that this guitar is the early version of the 496 model, which Hofner called the 499. It does not have the fancy pickguard or the purfling at the bottom of the body top of later examples, but otherwise all the usual features are there - gold plated tuners with elaborate buttons, ebony fingerboard with "arrow-head" fret markers, and superb body timbers. This very beautiful old guitar is owned by Russ Parker in Derbyshire, England. And a blonde version of the above. Owned by Dirk Schalla in Germany. In 1962, the 499 model was joined in the Hofner price lists by a cutaway version - the "499/S". In 1963, both model designations had disappeared and been replaced by the 496 model, a non-cutaway guitar. The body date on this particular guitar is September 1962, so this fits in well with the conclusion that cutaway-bodied 499(ii)/496 guitars were only produced in 1962. This 499/S is finished in cherry red sunburst finish, which seems more appropriate to the "new" 496 guitar however, so maybe it should be thought of as somewhat of a transition-guitar. Whatever, it is a superb looking instrument! Owned by Georg Strobel in Germany. Produced only between 1971 and 1974, this was the 6-string version of Hofner's 499(ii) 12-string guitar which was produced for a much longer period between 1967 and 1975. Being both high-quality guitars, the 499(ii) models had spruce tops with laminated rosewood backs, ebony fingerboards, and mother of pearl block fingerboard inlays. This one is owned by Georg Strobel in Germany. I'm not 100% confident that this guitar is a Model 4990, but it is a beauty! The rosewood back/sides look superb, and the guitar is obviously of a high quality. Owned by Sascha in Germany. Top of the flattop acoustic range in 1975, this beauty and its earlier 499/6 sister were actually derived from the 499 12-string guitar with which they share the block inlays in the fretboard and the lovely rosewood back and sides. Owned by Mike Nowak in the USA. The 4912 model was introduced into Hofner's Western range in 1973. It had a body cutaway, a blonde/natural spruce top and flamed maple back and sides, which were finished in a rather nice black/red/natural sunburst. Mother of pearl block fret markers were inlaid into the rosewood fingerboard. A very attractive looking flattop, owned by Siegfrid Dobat in Germany. This a very rare example of a 4912 factory-fitted with a pickup. An electric version of the 4912 was never mentioned in the Hofner catalogues or price lists. The pickup used is the short-lived unit which was introduced in 1975. Photos supplied by Norbert Schnepel at Musikkeller. No prizes for guessing where Hofner got their idea for this one with the dove sitting there on the pickguard! Beautiful red sunburst finish to the body, although a blonde finish was also offered, and mother of pearl block inlays to the fingerboard and MoP inlays to the "moustache" bridge. Introduced in 1976, and continued in the catalogue for two or three years. Some 12-string versions of this Gibson look-a-like also exist. In the early 1990's, Hofner introduced their "HA" series of acoustic flattops which superseded the previous long-running "4--" series acoustics. The HA-43 cutaway was the top of the new range, and featured a spruce/rosewood body, maple neck, and ebony fingerboard. It was offered with piezo electrics as a factory option, as on this guitar, owned by Bernhard Zubragel. Introduced in 1974 and based on the "Selmer Maccaferri" design made famous by Django Reinhardt, this exclusive guitar was initially offered in both fully acoustic and electric versions, although the electric was quickly dropped after a year or so. This was a top-quality guitar, with body top in cedar, back/sides in solid rosewood, and an ebony fingerboard. The price tag reflected this quality, being at the time three times the cost of a Hofner 470 acoustic archtop! A flattop guitar fitted with a piezo pickup, that was produced for a short time between 1989 and 1991. Apparently only fifty of these guitars were ever made. It features an elliptical sound hole and slotted headstock, with a heavily tapered body depth. I assume that it was Hofner's up-to-date version of the old "gypsy-jazz" Selmer Maccaferri guitars. It looks absolutely gorgeous though with a stunning black/red sunburst finish. Apparently a deluxe version was also produced called the Chrysalis Special. Owned by Bob Cocozza in Florida, USA. These two guitars aren't in the best of condition, but they do demonstrate how the details on a Hofner acoustic model can change dramatically over the course of a year. The 490 was introduced into Hofner's range in 1968, but by the following year, several fundamental changes had been made. A lovely original example of Hofner's base model 12 string guitar. Spruce top, blonde flame maple body back & sides, and a tilt-able mahogany two-piece neck. Owned by Norbert Boekhout in The Netherlands. A sunburst example of the 490, designated by Hofner as the 490G. This seems to be a fairly rare version as most 490's are a natural finish. Owned by Jacques Lognay in Belgium. .......and a slightly later sunburst 490G, with a slimmer headstock and more elaborate sound-hole rosette. Owned by Franck Raimundo in France. A nice original example of the 490, owned by Michael Bonnevie in Denmark. These photos show a 490E stripped down, with the neck tilt mechanism clearly visible. Owned by Paul Gorter in The Netherlands. Hofner's budget 12 string, the 490, was supplied with either a "polished" gloss finish, or matt. This is the matt version, and it's owned by William Schart of Texas, USA. This guitar displays the un-stained maple back and modest body binding of the 490, but has a fairly elaborate soundhole decoration. Owned by Bernhard Zubragel in Germany. Around 1975, Hofner introduced a new soundhole-mounted pickup with top mounted controls for the electric versions of their "Western" guitars. This new pickup seems to have been used for only a short time however, perhaps being overtaken by piezzo bridge units. The photos for this example have been provided by Norbert Schnepel at Musikkeller. A 492 fitted with a very unusual "T"-shaped bridge/tailpiece. Has anyone ever seen anything similar? Was this bridge factory fitted? An interesting guitar owned by Brian Penikas of the USA. A fine example of an early Hofner 492, with its spruce top and mahogany back & sides. Gary Scourtas, of Massachusetts USA, describes the guitar's recent history. ........and a brunette finish 492, owned by Ola Paulson of Sweden. Another 492, but this time an electric. The pickup is built into the end of the fretboard. Owned by Barry Garvin of Ontario, Canada. Hofner appear to have introduced a much up-rated version of the 491 (6-string) and 492 (12-string) in 1973. This had the spruce top and laminated mahogany back & sides of previous versions, but mother of pearl "block" fret-markers and double-diamond headstock inlay were featured. This version does not appear to have been continued for very long before the dot markers and plain headstock were re-introduced. A very nice guitar, owned by Shane in the USA. Spruce top and laminated mahogany back/sides, but a little less ornamentation than the 492 model, on which the 4920 is based. This one is owned by Frank Rokob of the USA. This is the rare 12-string version of the conventional 6-string 4914 as described above. Photos courtesy of Norbert Schnepel at Musikkeller. Top of the range model with spruce top and rosewood back and sides. Owned by Dennis Perkins in North Carolina, USA. This is an example of an early 499E factory-fitted with a pickup set-in to the end of the fingerboard. Owned by John Hyde of Sydney, Australia. A slightly later version of the 499E electric, now with the pickup cantilevered into the centre of the soundhole. Owned by Georg Strobel in Germany. I can't find any catalogue entry for this tenor guitar, but it is definitely an original Hofner-made guitar. Perhaps it was made to special order? It has 18 frets, but it actually has a 25" scale length, which is unusual for Tenor guitars and apparently gives problems with the normal CGDA tuning. They usually have a short 21" to 23" scale. Many thanks to Tom Dignan in Auckland, New Zealand for the pictures of his rare and interesting guitar. This model was distributed by Selmer in the UK throughout the 1960's, and was based on the Hofner 491 model. It's Selmer catalogue number was 5154. An electric version (5155), and acoustic and electric 12-string models were also available (5156 & 5157). This particular 6 string acoustic is owned by Graham Stockley in the UK. Probably one of the last Western Jumbos (Cat # 5154) brought into the UK by Selmer. This one has a double scratchplate and obvious signs of having been changed from right to left handed before being sold new to Kelvyn Taylor of Surrey, England in 1973/74. It was almost certainly "adjusted" by Selmer prior to being supplied to the retailer in Denmark Street, London as a left handed guitar. This guitar was made for about a year in 1966/67 by Hofner for Selmer to sell under their own brand-name. That was the period when Selmer commissioned Hofner to produce a whole range of electric and acoustic guitars with the Selmer logo only on them. This first version of the Arizona was based on the Hofner 491 model, but without neck binding and headstock ornamentation. This electric version is fitted with Hofner's fingerboard-mounted pickup. Photos courtesy of Paul Cook, Norfolk, UK. The acoustic version of the above guitar. Owned by Robby Morrow in the UK. The budget flattop in Selmer's catalogue, introduced around 1968 in the UK, was in fact the second model to be given the "Arizona" name. It was in-fact identical to the European/US market Hofner 489 model, with laminated spruce top and flame maple back and sides. An adjustable neck rake screw was fitted to the heel of the Arizona, in common with many of the non-Selmer flattops produced from 1968. This nice example is owned by Bob Bullock in the UK. A guitar that was actually the same as the Hofner's European/US market 4890 Model. It was introduced into the Selmer catalogue in the mid-1970's, together with a 12-string version. Although the "Blue Grass" seems to have been an up-dated and slightly up-rated version of the Arizona/489 model, Selmer offered both models together in their mid-1970's catalogues. Owned by John Robinson of North Yorkshire, England. Based on the Hofner 492 model, this was given the Selmer catalogue #5156. Intended as a mid-quality acoustic guitar and introduced into the UK sometime around 1963; just in time for the boom in folk/country music that was becoming popular around then. An electric version was also available. Another of John Lynch's guitars. The budget 12-string in the UK Hofner line. This appeared at the same time as the 6-string Arizona in 1968, and was in fact identical to the European/US market Hofner 490 model. It differed from the 6-string Arizona, in that it had a three-part neck as opposed to a 2-part on the Arizona 6, X-bracing instead of parallel, and a body/neck joint at the 12th fret in common with all Hofner 12-strings. This immaculate example is owned by Bob Bullock. An acoustic 12-string flattop with slotted headstock. Owned by Juanjo Llopiz Joga of Madrid, Spain. The electric version of the above, owned by Armand Valeta in Spain.